- Ascarids - Toxocara canis, Toxascaris leonina (adult and late immature forms). - Hookworms - Uncinaria stenocephala, Ancylostoma caninum (adults). - Whipworms - Trichuris vulpis (adults). - Tapeworms - Echinococcus species, Taenia species, Dipylidium caninum (adults and immature forms). 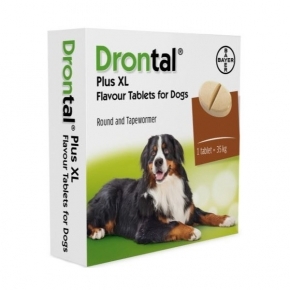 Drontal Dog Tasty Bone Tablets should be used to achieve accurate dosing in dogs weighing less than 17.5 kg. The dose is equivalent to 1 tablet per 10 kg.